All white hat hackers should master different tools for different phases in penetration-testing (reconnaissance, scanning, gaining access, maintaining access, covering tracks/creating report). It takes months or maybe years to master all the tools for scanning. A lot of information gathering and scanning can be done by active scanning using tools from Kali Linux distro. But if you want to master the field of scanning: try to play with passive scanning tools. Very useful if you don’t have your Kali Linux or command-line available. Active scanning for system information and vulnerabilities can return great benefits, but can also return great headaches. If not done carefully, it can be an ineffective and inefficient way to gather information. The chance is high that traces of the scan can lead back to your scanning-host. Passive scanning (there is no active or direct connection between your host and the target) can be less sensitive and can be a lighter touch on the network. It provides accurate, up-to-date information without a direct trace to your host. 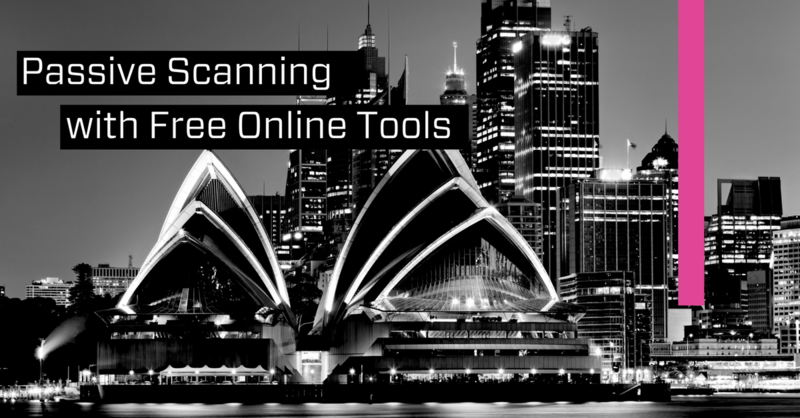 Passive scanning can be done with a lot of free quality online tools. Don’t forget to add these to your bookmarks. Check also the topic about “hybrid-scanning” (combination of active and passive scanning). Feel free to post additions and comments below. Nice article with some very powerful tools.